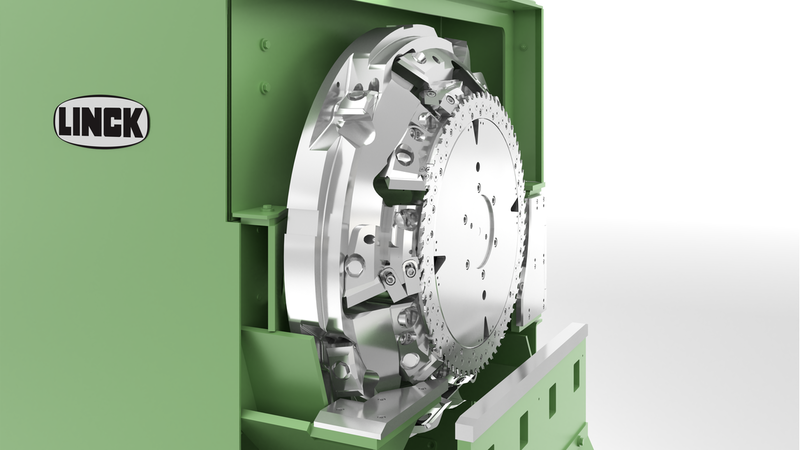 At LIGNA 2019, LINCK presents a new generation of cutter heads for its chipper canters. The number of knives of this three-step cutter head can vary between three and six depending on the requested chip length. For producing fine chips, the number of knives in the first step can be doubled. In contrast to the previous knife disc which has a truncated cone shape, the new generation cutter head is designed with a cylindrical outer disc. This flattening leads to a reduced disc diameter. The rollers in front of and behind the chipper canter can thus move closer to allow a better guiding of short logs. The reduction in diameter also reduces the overall length of the machine affecting the necessary log gap for optimization processes that require an adjustment of the chipper canter. Of course, this new generation includes all well-known advantages of the today available cutter heads, i.e. guide disc, the possibility to change from saw rings to dressing knives, the use of regrindable knives and the production of high-quality chips.